Adwind ransomware uses sophisticated techniques to infiltrate computers and hide from its victims. Use Reimage to determine whether your system is infected and prevent the loss of your files. 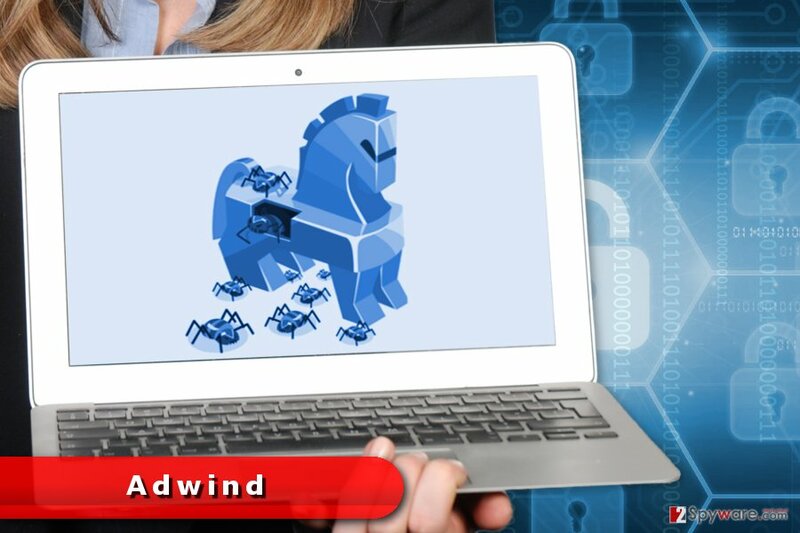 Adwind is a dangerous Trojan horse that might attack Windows, Linux and Mac operating systems. The malware is detected as Backdoor:Java/Adwind, Trojan:Java/Adwind.E, Java/Adwind.E or Trojan:Java/Adwind.E. It usually enters the system when user clicks or downloads infected content. The Trojan has been noticed actively spreading in the United States, Portugal, and Italy. However, users in other countries have already suffered from this cyber threat too. Malware is suspected of stealing sensitive information, such as banking details, credit card data, logins, etc. Therefore, Adwind removal should not be delayed. This parasite is written in Java and after infiltration hides deeply in the system. On the affected device it might download numerous malicious files and run harmful activities. It might open the backdoor to other malware and disable security software. Thus, it can bypass weak antivirus or prevent you from removing it easily. The Adwind virus might make modifications on Windows Registry, delete or create new entries. Such activity assures that malware boots with system startup. It might delete particular files, corrupt programs and prevent from using the computer normally. Due to the trojan’s infiltration, the computer becomes slow and sluggish. Malware might also establish a connection with remote command and control server. As a result, other malicious programs might be installed to your computer. The research has shown that this Trojan might download spyware or even ransomware executable. Thus, this cyber threat might put your device, files, and private information at risk. We highly recommend scanning the computer with Reimage or another security software once you notice at least few of the previously mentioned symptoms of the infection. However, we have said that Trojan might block antivirus programs. Thus, in order to remove Adwind, you may need to follow our prepared instructions at the end of the article. The research revealed that this Trojan might also be responsible for distributing ransomware. The discovered Java-based file-encrypting virus is still under investigation. However, possibility to get your files encoded should be another encouraging reason to wipe out this parasite from the PC. 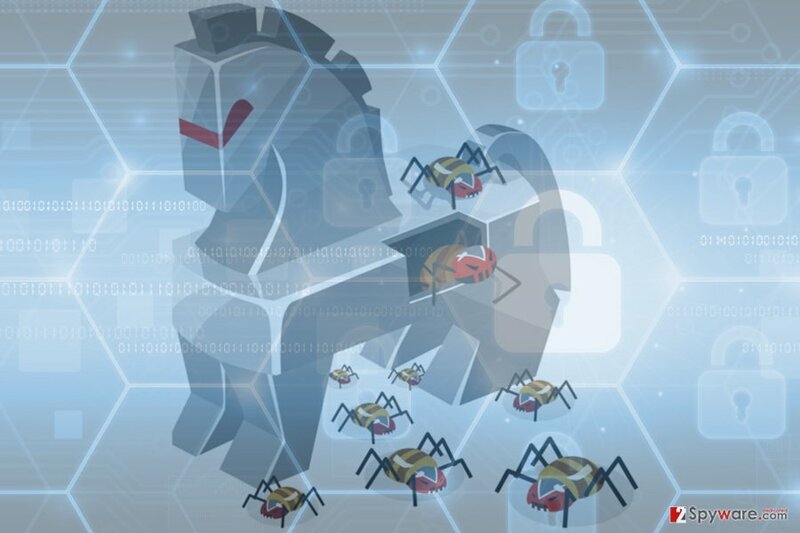 Adwind is a dangerous Trojan horse that might open the backdoor on the affected computer. Adwind malware might enter the system when you click on an obfuscated email attachment or infected link. Malicious emails are the most popular malware delivery method. Thus, you have to be careful with unknown letters that urge to open provided document and check some important information. Torrents, P2P networks, and other untrustworthy file-sharing sites might also spread Adwind in the form of a useful program. Usually, malware hides in illegal downloads. Thus, you should always purchase a licence for the necessary software to protect your PC. You should be vigilant and never click on unknown content, links, ads and download each offered program. Finally, keeping software and operating system up-to-date also helps to prevent the virus to exploit system vulnerabilities to launch the attack. Nevertheless, the Trojan disables and blocks security software; you have to use malware removal tools to get rid of it. We recommend completing Adwind removal using either Reimage or Malwarebytes MalwarebytesCombo Cleaner. These programs are designed to locate and delete malicious files from the system without causing any damage. To launch the installation of anti-malware, you need to reboot the computer to Safe Mode with Networking in order to disable the virus. The instructions below will show you how to do it. Besides, if you have suffered from a variant that encrypts files, after Adwind removal, you should look up at our prepared data recovery options below. Or you can plug in USB drive with backups and copy necessary data from there. If you cannot run automatic Adwind removal, you should reboot the computer to Safe Mode with Networking as shown below. Then try again. Log in to your infected account and start the browser. Download Reimage or other legitimate anti-spyware program. Update it before a full system scan and remove malicious files that belong to your ransomware and complete Adwind removal. When a new window shows up, click Next and select your restore point that is prior the infiltration of Adwind. After doing that, click Next. Once you restore your system to a previous date, download and scan your computer with Reimage and make sure that Adwind removal is performed successfully. Guide which is presented above is supposed to help you remove Adwind from your computer. To recover your encrypted files, we recommend using a detailed guide prepared by 2-spyware.com security experts. If some of your files were encrypted or corrupted after the Adwind attack, you should try Data Recovery Pro to restore them. If System Restore method has been enabled before ransomware attack, you should follow these steps and restore individual files. ^ John Fuller. How Trojan Horses Work. HowStuffWorks. Explanations, reviews, opinions and prices for the Internet, home networking, hardware, and software. ^ SemVirus. SemVirus. Portuguese website about malware and virus removal guidelines. ^ Chris Valentine. The dangers of illegal downloading on your PC. Odd Culture. 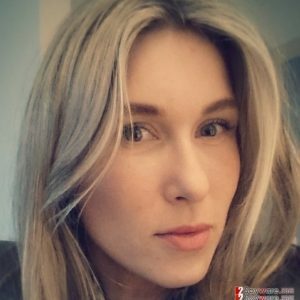 Lifestyle Blog and Resource. This entry was posted on 2017-07-12 at 03:16 and is filed under Malware, Viruses. You can quickly scan the QR code with your mobile device and have Adwind virus manual removal instructions right in your pocket. How did you remove Adwind virus?